"I always wanted to run for office," Bill Hobby writes. "And I grew up in a family that had been part of state government for a couple of generations." An excerpt from the forthcoming How Things Really Work: Lessons from a Life in Politics. I always wanted to run for office. From the time I was parliamentarian for Lt. Gov. Ben Ramsey in 1959, I knew that lieutenant governor was the office to which I was best suited. Though I had not held office, I knew something of the workings of state government. I had been a University of Houston Regent (1965-1969), appointed by Gov. John Connally, and a member of the Texas Air Control Board (1969–1971), appointed by Gov. Preston Smith. I had covered the Legislature as a reporter for the Houston Post and supervised coverage as editor. Also, I knew a good deal about Texas’s welfare system, because Lt. Gov. Ben Barnes named me chairman of the Senate Interim Committee on Welfare Reform, which studied the system for two years and recommended changes. And I grew up in a family that had been part of state government for a couple of generations. 1. The job was open, because the incumbent was not running. My friend Ben Barnes was running for governor. 2. The Sharpstown scandal had tarnished incumbents (rightly or not) and made it a good year for new faces. 3. In years ending in “2,” all (not half) the Texas Senate seats are up for election. I hoped, wrongly, that the absence of mid-term “free rides” would reduce the number of senators running for lieutenant governor. Sharpstown was by far the biggest factor in Texas politics that year. In 1971, the Legislature passed two bills that led to a U.S. Securities and Exchange Commission (SEC) lawsuit and what became known as the Sharpstown scandal. The SEC accused several Texas lawmakers of taking bribes to get the bills passed. The alleged bribes were loans from the Sharpstown State Bank of Houston, which the lawmakers used to buy stock in the National Bankers Life Insurance Company and then quickly sold for large profits. The bank and the insurance company were owned by Frank W. Sharp of Houston. The SEC filed a civil suit, not a criminal one, that named Gov. Preston Smith, House Speaker Gus Mutscher, state Democratic chairman and state banking board member Elmer Baum, Rep. Tommy Shannon of Fort Worth, and Mutscher’s aide Rush McGinty. Mutscher, Shannon, and McGinty were indicted for conspiracy to accept a bribe and found guilty in early 1972. Governor Smith was named an unindicted co-conspirator. In the Democratic race for governor, the “old faces,” Smith and Barnes, ran third and fourth. The “new faces,” Dolph Briscoe, a Uvalde rancher, and Frances “Sissy” Farenthold, a Houston state representative, ran first and second. In the Democratic race for lieutenant governor, the “old faces,” Senators Wayne Connally, Ralph Hall, and Joe Christie, ran second, third, and fourth. A “new face” — mine — ran first. Half those elected to the Legislature that year were “new faces.” As Ben Barnes put it in his book Barn Burning, Barn Building, “Even Texans who didn’t have the stomach for reading long articles about stock tips, loans, and banking legislation could understand headlines that screamed ‘fraud’ and ‘Democrats.’"
Ben was a fine lieutenant governor — the third best we ever had (the first two were named Hobby). Ben was not involved in Sharpstown, but he was in the wrong place at the wrong time. My runoff opponent was Sen. Wayne Connally, brother of former Texas governor John Connally, who served from 1963 to 1969. In 1972, John Connally was secretary of the treasury, appointed by President Richard Nixon. The treasury secretary is, of course, the boss of the Internal Revenue Service. That relationship didn’t hurt Wayne Connally’s fundraising at all. And, somehow, the Internal Revenue Service started auditing me. The campaign was long and nasty. The first clue that I would win came the week before the election. I made a campaign trip to Amarillo, an area I had expected Wayne to carry. When Sen. Max Sherman met me at the airport and introduced me at the event — the first senator to do so in the campaign — I knew that was a good sign. Max became one of my closest friends. Early in the afternoon of election day I had another good sign. My campaign manager in a large county that I thought was also Connally country called to tell me I would carry that county by a few votes. “Bill,” said my friend, “Marilyn is the county clerk here. I got her divorce for her years ago, and we have maintained a close personal relationship.” I carried the county by a few votes. That campaign was part of a learning process for me. I ran again in 1974, 1978, 1982 and 1986 (in 1974 the Legislature changed the terms of most state-wide offices from two years to four). One of the campaign truths was that, at that time, there were about twenty counties in Texas that were “one-stop shops,” meaning that politics in the county was pretty much up to “the man.” If “the man” was for you, you would get about 75 percent of the vote. If he was against you, you would get about 25 percent of the vote. In Fayette County, the man was Sheriff Jim Flournoy of Best Little Whorehouse in Texas fame. Jim liked me, so I was golden in Fayette County. He had the ladies of the Chicken Ranch address postcards endorsing me, and I got about 100 percent of the vote every time. I had no Republican opponent when I first ran in 1972. I didn’t waste any time announcing for re-election — I did it in August 1973. My opponent in the 1974 Democratic primary was Gaylord Marshall, a commodities futures broker from University Park. He called me a liberal — pretty much the standard charge from my opponents. He raised $8,000. I won with 70.9 percent of the vote. I was re-elected in 1978 without significant opposition from either party. But in 1982 the Republicans decided my free ride was over. My opponent was George Strake, a Houston oilman who had been appointed secretary of state by Gov. Bill Clements. This was not to be a walk in the park. Strake had some name identification from his work for Clements, and he was well known in Houston. His campaign was well financed and professionally run. Strake came after me with the usual Republican stuff — I spent too much state money, and I was soft on illegal aliens. Worse than that, the state budget had grown! It certainly had, but not by enough. Texas, then as now, was one of the fastest growing states and trailed the nation in public education and public services. Strake didn’t want undocumented workers to go to public schools. I guess he wanted them to go on welfare or to prison. In the fall of 1982, I had a fifteen-minute debate with Strake on KERA, the public television station in Dallas. George Christian, Sen. Don Adams, and my campaign staff had prepared a briefing book with answers to every conceivable question and accusation. I left the briefing book on the plane. During the debate, Strake went first. What a shame, he said, that we have only fifteen minutes to this debate. It would be impossible to fully air all the great issues of state in that brief time! He offered to pay for a longer debate. Afterward, people compared the non-debate to a scene from the movie Raiders of the Lost Ark when Indiana Jones is confronted by a Turkish bad guy wielding a scimitar. The bad guy whirls and twirls and tosses his scimitar around for the crowd, and, while he is showing off, Indiana Jones shoots him. Strake is a wealthy Roman Catholic. He made a television spot emphasizing his ties to the pope. The spot was intended to run in South Texas. His campaign probably wasn’t helped when it somehow ran in East Texas. The 1982 election turned out to be a good day for Democrats. Mark White was elected governor. I was re-elected lieutenant governor, and Democrats got elected to every statewide office. U.S. Sen. Lloyd Bentsen and I got credit for creating a unified and well-funded Democratic effort run by Bentsen’s savvy political strategist Jack Martin. I provided about half the funding, and the combined effort pulled some of the weaker candidates across the line. 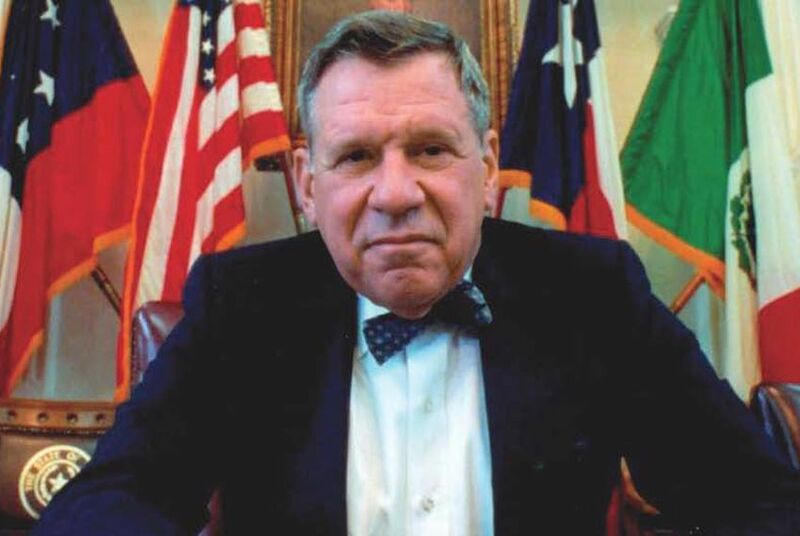 When I was running for re-election in 1986, Strake was chair of the Texas Republican Party. He said that I would not be a target for the Republican Party. “We will focus our resources on other races”, he said.